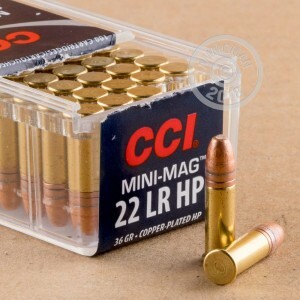 CCI's 22 LR Mini-Mag ammo is a perfect multi-purpose round for your gun safe. These rounds are loaded with a 36 grain copper-plated hollow point bullets. This ammo will have muzzle velocities of about 1260 feet per second, and will operate in any bolt action rifle or semi-auto rifle/pistol. This velocity, combined with a copper-plated hollow point, can easily deal with any of the following backyard pest: squirrels, rabbits, snakes, aluminum cans, ground hogs, prairie dogs, and old fruit. Order 99 dollars or more and you will qualify for free shipping at AmmoMan.com. Don't hesitate, order your ammo today, and have fun shooting! Ordered five. Two of the five arrived in busted cases and the rounds were laying within the packing paper. Either not packed as tightly as they could have been or FedEx played catch with the container. great deal on good shooting ammo. only one that works without issue in my sig mosquito. I've ordered a bunch but recommend ordering in quantities of 5 so they come in the display box. This way they are better protected. The last go around I ordered 6 boxes and the one loose one had no protection, no wrapping, nothing to protect it which damaged the case. Haven't heard back from them regarding this complaint, but will still order just in bulk quantities of 5. This ammo has always worked well. Price is up but, that's the way of the world now. When I mixed these mini-mag bullets with standard LR ammo, the difference was remarkable. These are so much more powerful! I have shot about 500 rounds so far and no issues with misfires, jams, stovepiping, etc. Great product, great price plus free shipping over 100, no one else comes close! Never a FTF, dud, jam - zero. Minimags, Subsonic, Quiet -- flawless. Same with Eric and Ammoman. Been doing business since mid-80s at gun shows. Shipping, selection, variety, consistency. What's higher than A+? 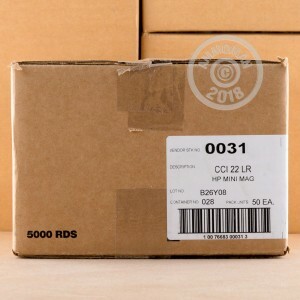 Great ammo it's just that EVERYTIME I have received this the plastic cases are broken and some of the shells are damaged and floating around in the packaging! Holy price gouging! You can find cheaper pretty much everywhere else. The mini mags work flawlessly in my 1911 Kimber conversion as they recommend. I will be ordering more. Never fired. Stocking up right now. Great service selling quality ammo. 2thumbs up. Highly recommended for prices, quick shipping, and great selection. 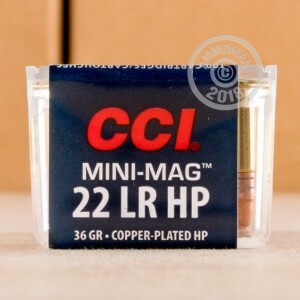 CCI minimag is unobtainium in my area. Works great in my sig semi auto. Wife has a Sig Sauer misquito and the only ammo that works really good with it is mini mags. Nice gun, nice ammo.